The Big Rock Nature Trail travels from the ridgeline near the lake down into a mountain hollow, then crosses a dividing ridge and returns up Gold Mine Creek. It passes several small cascades and waterfalls. Wildflowers are abundant in spring. The Gahuti Trail travels around the edge of the park, passing just below the summits of both Cohutta and Fort mountains. Ever changing, the trail is both beautiful and challenging in all seasons, so hikers should always be aware of changing weather. Four backcountry campsites are available for use by permit only. The trail ends at the scenic Cool Springs Overlook with views of the Holly Creek Valley and Cohutta Mountains. Open to both bikes and foot traffic, this trail loops around Fort Mountain’s lake and can be accessed from the campgrounds, cottage areas, picnic area and picnic shelter #5, and the Big Rock Trail parking area. The trail is most accessible traveled clockwise. In this manner, users descend the 75 lineal feet 20% grade. 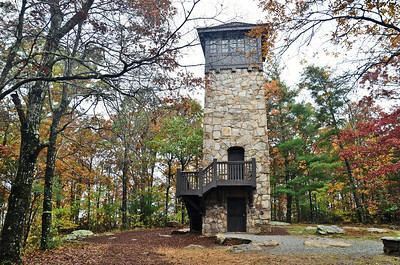 The Stone Tower Loop is hiked by traveling uphill on the West Overlook Trail and returning on the CCC Stone Tower Trail. 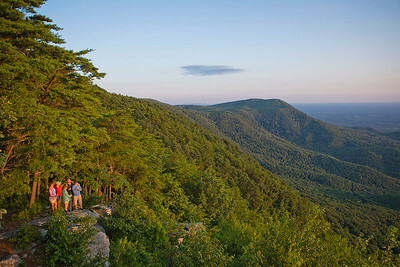 Enjoy year-round vistas from West Overlook. Hike includes some natural rock gardens and CCC built steps. The Upper Cabin Loop is hiked by using the Upper Cabin Access Trail to the Lake Loop, proceeding to the Goldmine Creek Trail and returning on the Gahuti Trail to the upper cottage area. This combination of trails offers excellent vistas from the ridgeline and wonderful views of the lake and Goldmine Creek. The creek was named for early goldmining, with some of the old mining pits visible along the trail. The East-West Bike Loop is rated by many as one of the most beautiful and challenging mountain bike trails in the Southeast. It is open to both mountain bikers and hikers. Users travel from mountain ridge top to valley floor, through pine and scrub laurel thickets, upland hardwood and cove forests, by old mines, then waterfalls and rhododendrons along Hassler’s Mill Creek before returning up the mountain. Contact the stables at 706-429-5075 or at FortMountainStables@gmail.com. More than 25 miles of horse trails offer loop rides varying from 3 to 16 miles. Riders must bring their own horses and register at the stables, or visitors can take guided trail rides with the concessionaire. First-time riders must attach a photocopy proof of a negative Coggins test. Parking is at the stables access (west side of the park). Check the website or call ahead for trail closings during bad weather. The horse trails pass through varied environments, from lush forest coves to wind-swept ridge tops. Wildflowers catch the eye in early spring, green foliage is bountiful during summer, changing leaf colors welcome fall, and spectacular vistas arrive with winter. Cliffs, waterfalls, old mines (some that provide natural “air-conditioning” during summer and warm air during winter), and abandoned mining equipment add interest to the trails. Horse watering stations are at approximately two-mile intervals. The shorter loops, which begin at the stables and go past waterfalls, are the easier trails, with most at a 20% or less grade. Basic rules apply: riders must stay on marked trails; no trail riding between sunset and sunrise; no reckless or fast riding; and horses should not be left unattended or unbridled. Anyone found in violation of these rules will face criminal prosecution (OCGA 12-3-10) and be banned from use of horse trails at all state parks.